In some of my past posts I mentioned that I believed that Tasmania was the location of the ancient Tower and City of Babel and a centre of the ancient world and that Ararat was at Mt Cook in New Zealand. 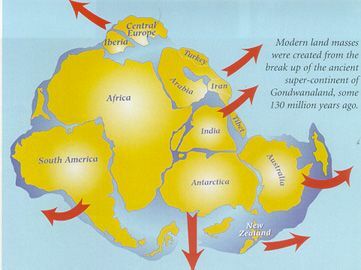 This was before the breakup and formation of the continents over 4,000 years ago. Part of the great Sin or Sinar (Shinar/ Sinim) plain was to become the plateau that covers most of Australia (known as the Western Plateau or Australian Shield) and the other eastern part went under the water in the area we today call the Tasman Sea and Southern Ocean surrounding Tasmania. There were huge man-made causeways with huge man-made water canals leading to Babel (Lebab) across the ancient plain of Sinar leading to Mt Lubar and Mt Lebab. Lebab means Heart and Babel is the reversal of the word. The books of Enoch and Jubilees refer to Mt Lubar as the mountain that the Ark landed on, so Lebab and Lubar may be two different mountains that became confused in later accounts. If not then the three cities of Sadek the White City (in Gondwanian Tasmania or Australia), Nahal the Black City (in Gondwanian South America/ South Africa) and Adan the Red City (in Gondwanian Antarctica) may have been to the east (Shemites), south (Hamites) and west (Japhethites) of Mt Cook (Aoraki) rather than Tasmania (Lebab/ Babel/ Leban). However we cannot be sure of the geography of this time as the continents had not broken apart yet. The story of Noah's Ark being in New Zealand is confirmed in the Maori legends of Aoraki's Canoe. The Book of Jubilees refers to the making of the stone-like bricks for the Tower and City: "...For they departed from the land of Ararat eastward to Shinar; for in his days they built the city and the tower, saying, 'Go to, let us ascend thereby into heaven.' And they began to build, and in the fourth week they made brick with fire, and the bricks served them for stone, and the clay with which they cemented them together was asphalt which comes out of the sea, and out of the fountains of water in the land of Shinar...". This is the so-called dolerite rock that evolutionary science associates with a kind of volcanic rock but is in fact man-made in a process and with a technology that is now unknown. 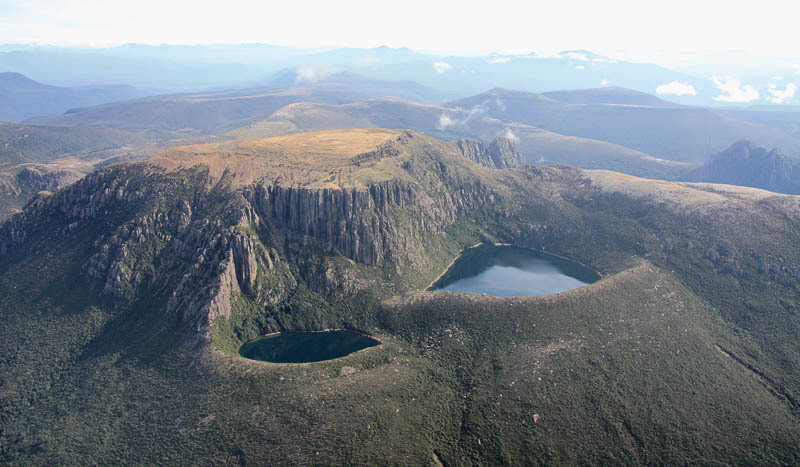 The dolerite rock that covers much of Tasmania is the remnants of the great City and Tower of Lebab. 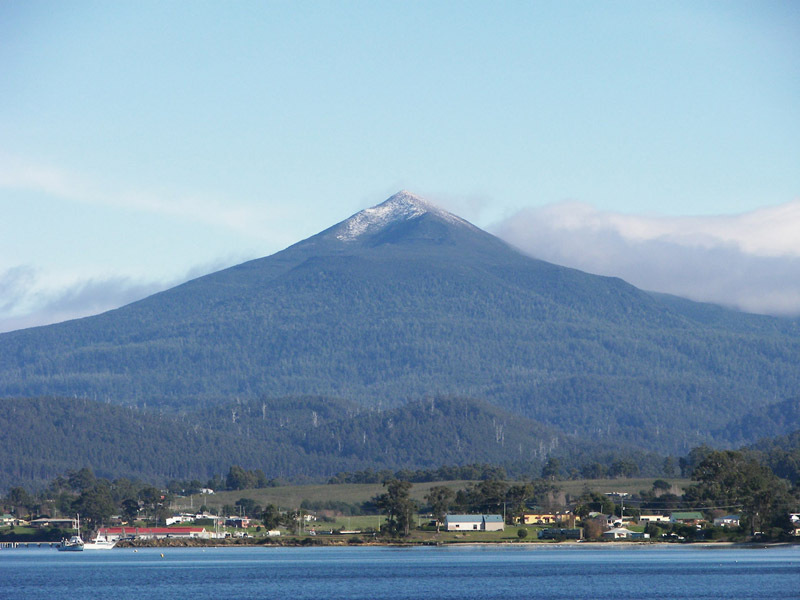 At this time Tasmania (site of Sadek and Lebab), Zealandia (site of Mt Lubar) and Victoria Land in Antarctica (site of Adan) were close together and had great cities and Towers made of Dolerite bricks. Nahal was to the south west of Mt Lubar when parts of Godwanian southern Brazil and Namibia were close together and to the Godwanian southern tip of Zealandia (now under the Sea south of Maquarie Island). The process for producing these dolerite bricks may have been part of what led to the splitting of the continents. Many translations say that one travelled eastward from Ararat to Shinar whereas it could possibly also read that the Land of Ararat was to the east of the great plain of Shinar (Sinim). If Shinar or Sinar was in Iraq then these directions make no sense as the Ararat in Turkey/Armenia is directly north of Iraq. The Armenian Land of Urartu at some stage of history and legend became associated with Ararat. However if Pangaea or Gondwana were the shape of the earth in the time when Noah landed on Mt Cook then one indeed would go eastward to the great plain of Shinar as New Zealand (Zealandia) was at this time to the West of Australia and Tasmania rather than the east as it was after the breaking up of the continents. Was Pangaea the pre-flood land and Gondwanda the post-deluge shape? Or is there a better scenario? It would seem that before the destruction at the time of Babel that mankind (Japhethites) had also settled in the areas that were to become North America and the British Isles (the western coastlands of Laurasia) where Dolerite is also found today. I also think that the original Yeshivah or Academy of Noah and Shem may have been in a valley south of Hobart and that the Tomb of Shem is the pyramid shaped mountain of Adamson's Peak in Tasmania and that the smaller pyramid shaped mound near Adamson's peak is possibly that of Shem's wife. Some locals call them the Cow and the Calf. It is possible that the Adamson's Peak area are the tombs of Shem and his family and that Noah and his wife are buried near the original Mt Lubar or Ararat (Aoraki) in New Zealand. Could the Dolerite ruins of Mount La Perouse be the remains of this Academy or was it a fortress of the Shemites? Abraham was to spend some time as a child and later as an adult at this Academy of Noah and Shem (see the Book of Jasher) in Tasmania. 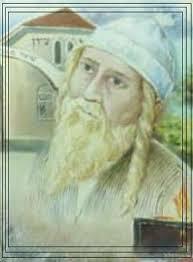 A second Academy of Shem and Eber was established in Canaan at Shalem run by Melchizedek who had taught Abraham in the Academy of Noah and Shem previously. Isaac may have also gone to the south-eastern Academy of Noah and Shem after the events of the Akedah (Binding) for three years. At this stage of research I would posit that something similar to the modern scientists' Pangaea was the one landmass before the Flood and that Gondawana and Laurasia of the modern scientists was similar to the geography of the earth after the Deluge. However the southern parts of South America and South Africa may have been further south and east of the map used above. The present shape of the world's geography dates from 1530 AD and 1606 AD when numerous lands sunk under the Indian and Pacific Oceans, however the present locations of the continents date from the time after the Destruction of Babel just over 4,000 years ago. A true map or model of Pangaea and Gondwana would need to take into account the ancient lands that have now sunken under the Sea and the ancient coastlines that are now also under water and many other factors. Unlike the theories of evolutionary scientists I hold that the splitting of the continents was a rapid process causing by man-made cataclysmic events not one that took millions of years through uniformitarian and evolutionary processes. 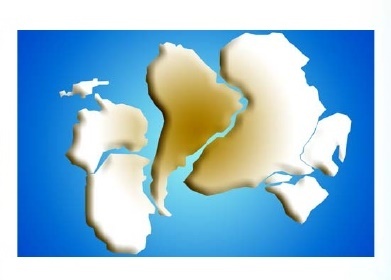 Even some evolutionary scientists believe that the splitting apart of the continents was not gradual but occurred in one huge cataclysmic event such as Paul Renne (a Professor at Berkeley University) and his researchers (in "Science" magazine April 23 1999). Pangaea (and Gondwana) was most likely originally a circular landmass with a circular large sea or Lake in its interior. It looked like a wheel or a dinner plate. 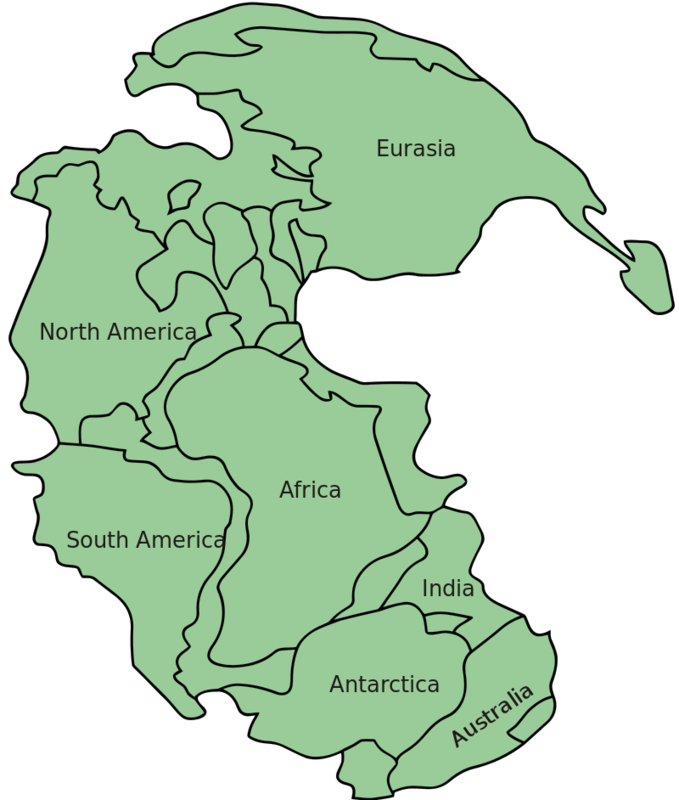 After the Flood, Gondwana was a more fragmented version of the circular Pangaea from before the Flood. At the time of the cataclysmic events of Babel, Antarctica was pulled south between Kergeulen and Zealandia, pushing Kergeulen to the West and Zealandia to the East. As Kergeulen moved west so South America, Mauritia and Africa moved west. As Zealandia moved East so the southern part of Australia pulled Australia around into its present position. These movements created the Atlantic and Indian Oceans. Before the Flood the Interior Sea was a huge mountain on which the Garden of Eden was located surrounded by the fifth or head River of Eden from which the four major Rivers flowed into the rest of Eden (the rest of the Land). The Nile, Congo, Niger, Amazon and Rio de la Plata rivers were once part of the same primordial River that flowed to the south-west through Godwanian Africa and South America coming out to the Ocean near the great Hamite city of Nahal (near Gondwanian Uruguay, Namibia and South Africa)). This was the Black (Nahal) city which was made mostly of black dolerite. This primordial River was called the Gihon. The Pishon River that flowed to the south-east has remnants in the modern day Ganges River (the original Indus River) in India, the Dalay River (the original Ganges River under the Timor Sea today) and the Swan, Fitzroy and Murray Rivers in Australia. The Chidekel flowed to the north-east and the Euphrates River, Persian Gulf, Yellow and Yangtze Rivers are remnants of this river. 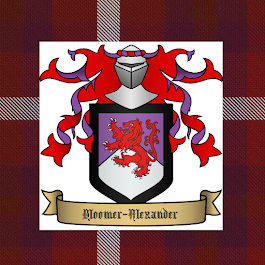 The Parat flowed to the north-west and its remnants are the Volga, Don, Black Sea, Danube, the Rhine, the Thames, the River Severn, the River Bann, the Pjorsa and the ancient River under Ice of Greenland. When the asteroid at the time of the flood struck the earth in the area which is the Pacific Ocean today, the circular mountain of Eden was pushed forth and collided with the Moon of that time which became the planet Mercury in a new location while the Garden of Eden mountain became the present moon. The circular hole left with the removal of the mountain became the Interior Sea after the flood and after the Tower of Babel (and another possible asteroid impact in Mexico) parts of the Mediterranean Sea, the Black Sea, the Caspian Sea and Aral Sea are remnants of this ancient Interior Sea which had been pulled to the north-east during the cataclysmic events. 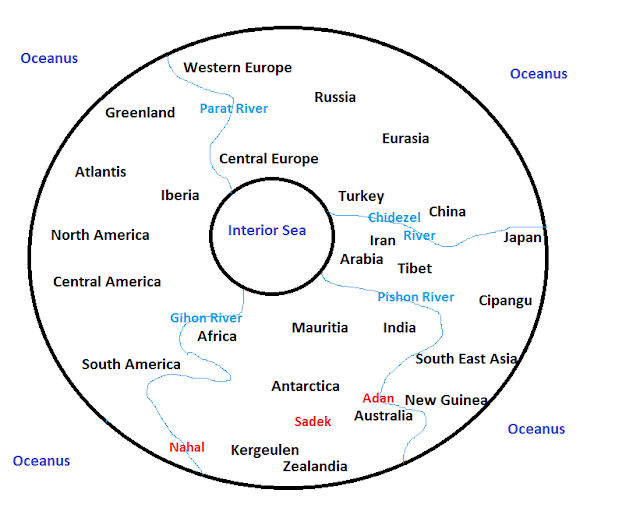 Alternatively the round or circular Sea and its bed in the centre of the landmass of Pangaea may have been pulled north west causing the separation of Atlantis, North America, Greenland from Iberia and Europe and today is the circular sea we call the Arctic Sea or Ocean. Due to its move it created the space for the northern part of the Atlantic Ocean. The space left behind (the Mediterranean Sea area) and the new position of this circular Sea (Arctic Ocean) caused Europe to move further south and Africa further north into the vacated space drawing Europe closer to Africa. The Pacific lost island continent which Marco Polo calls Cipangu (which others confuse with Japan) is called Pan or Mu by some. It was originally in Pangaea in the place where some place the socalled Tethys Sea. During the cataclysmic events Cipangu or Pan moved to the east into Oceanus leaving what scientists call the Tethys Sea to form. Then India (which was then connected to Australia and Antarctica) was drawn across this sea and collided with Asia forming rapidly the Himalaya mountains.The Cipangu of the time of Marco Polo was a smaller large island remnant (1,500 miles off the Chinese coast) of this continent which totally disappeared under the sea some time after 1300 AD (probably in 1320 AD), except for some small islands. The Events of the Flood caused cracks in the "dinner plate" and the events of Babel caused the "dinner plate" to be broken and pulled apart forming the continents. It must always be remembered that the Ocean of earth before the Flood was a lot smaller and after the Flood the earth contained much more water probably from the Ocean of Mars. Scientists now believe that at least 20 percent of Mars was once covered with water. The rivers and other features on this diagram are not accurate and just very roughly placed. 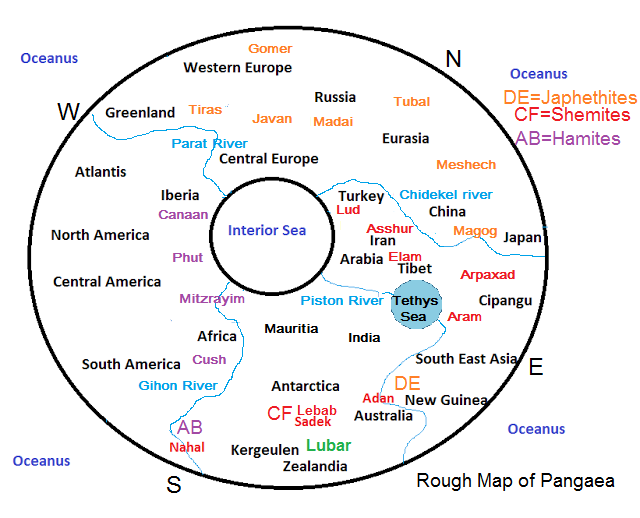 Added October 7 2015: I just found an interesting paper that also believes that Pangaea was originally circular though they place New Zealand to the north east of Australia rather than the south west as does my model and other models of Pangaea. □ This research suggests that Pangaea might have existed in a circular shape until it started to break up into separate parts. -The radius of the circle that circumscribed Pangaea was about 9,000 km. -Comparing Pangaea to present geography revealed that Pangaea's geometric center falls somewhere within the modern Sinai Peninsula. □ A notable feature of Pangaea as reconstructed in this study is the two circular inland seas. -One corresponds to the Tethys Sea. The other corresponds to the present Arctic Ocean and is several times larger than the Tethys. -From a geological viewpoint these inland seas appear to be oceanic crust contained inside continental crust, and it is likely that they were connected to the Panthalassa Ocean by the sea. During the Permian period, about half of the Pangaean continent was under water. □ This study shows that Pangaea was likely circular. However, the result may provide much more important information than merely revealing a beautiful geometric configuration. -One hypothesis is that the circular shape of Pangaea with two circular inland seas might have resulted from large-scale melting of the earth’s crust, as no other geological process would likely produce this arrangement. - The large-scale melting of the earth’s crust seems to have taken place at the close of the Paleozoic, during the Permian. The greatest mass extinction events on the planet occurred during that time. 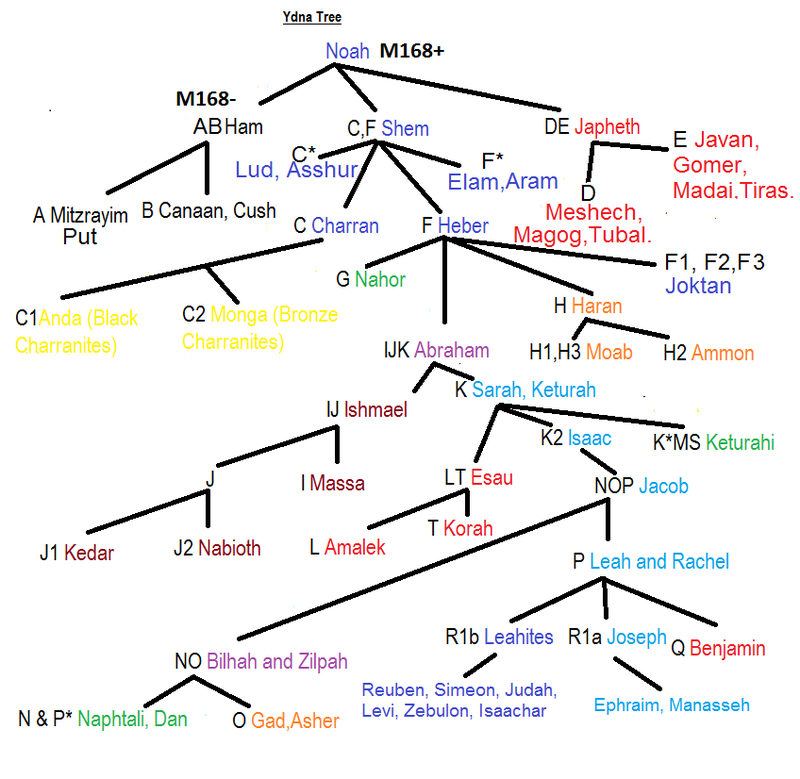 I dont know what to make of this, since some Chinese christians have said Eden was in the Taklamakan desert, China, some Indians say that Eden is Kashmir, that Abraham came from India, that Shinar is in India, and Joseph Smith said Eden was in America. Its easy to see the function these claims serve, to believe ones own country is special in that way... i think its more likely that stories of Eden come from the sunken lands of the Persian gulf or perhaps Sundaland. The claims about Eden becoming Mercury are baffling, i dont know of any mechanism where that could happen or any tradition that could indicate this. Though some Aboriginal traditions like around the Wolf Creek crator mention Venus and the Moon getting too close, which may match Veliskosky ideas of Venus causing chaos in ancient times. How could the planet mercury sit ontop of the center of Australia. 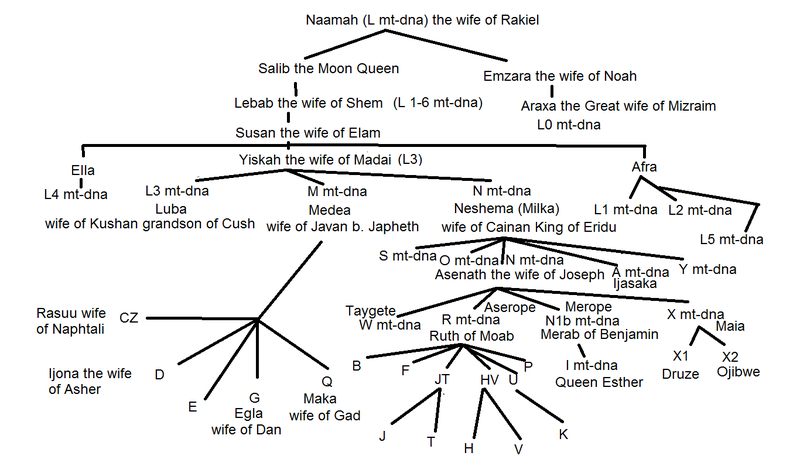 Some Islamic traditions seem to indicate Eden was in the sky, not the earth. I really want to know what these ideas are based ob though, since alot of other things you mention do match up a bit to my own finds in alternative history. Dear Daniel, You might find this interesting by Velikovsky http://www.varchive.org/itb/ecadam.htm Also one of the main scientific opinions is that the moon may have been formed out of the earth from the region of the Pacific basin.